A British historian said this about death: the consequence of birth is death. Once we are born into this world, the threat of death hangs menacingly over us. We do take ill, and recover from it. Then, we will go to either church or Mosque to thank God for healing us. But, a person’s recovery from an illness is a postponement of the evil day, a time of reckoning with God. Today, death is commonplace. And mystics, metaphysicians, agnostics, Church ministers, Islamic mullahs, Buddhists, and others had written books on thanatology. Yet, we dread death, regardless of the fact that we possess the knowledge that our souls will survive our physical deaths. It is the fact that the sting as well as the finality of death is irreversible that causes us to mourn our dead relatives, inconsolably. So, I could not come to terms with the reality of the death of Dr. Alex Ifeanyichukwu Ekwueme when the macabre news of his death broke. While alive, he loomed larger than life, and seemed to be indestructible. He’s a national treasure of whom we are proud. So, when we heard about his death, we wished that it was false news. The news of his death reverberated across Nigeria and sent shockwaves throughout the length and breadth of the country for he’s well known in Nigeria for his countless and unquantifiable contributions to our national development. The late Dr. Alex Ekwueme came into prominence and national limelight when he became the Vice President of Nigeria. He served Nigeria meritoriously in that capacity. And, he belonged to the then popular National Party of Nigeria (NPN), a political party with national spread and outlook. 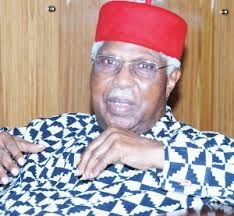 His belonging to that political party is a proof that the late Dr. Alexander Ekwueme was a detribalized Nigerian. Then, his fealty to the country was not in doubt. Sadly, the Jackboots and Brasshats cut short the leadership of NPN in the Second Republic via a military coup. The late Dr. Ekwueme and others were thrown into detention for allegedly enriching themselves through corrupt means. However, later, he was freed. And he was not found guilty of the allegations preferred against him. In fact, it was discovered that he left office poorer than when he assumed office as the Vice President of Nigeria. Urbane, knowledgeable and kind, Ekwueme was not tainted by controversies and corrupt deeds while he played partisan politics in the murky Nigerian political terrain. His style of politicking and political philosophies should be recommended to today’s politicians. After the military interregnum in our politics had ended, he and other like-minded politicians formed the G-34 group that metamorphosed to PDP. PDP was the party to beat in the 1999 Presidential election and Ekwueme was in the running to win the PDP Presidential ticket. However, the political shenanigans and treachery of his ethnic compatriots, the interests of Nigeria’s kingmakers, and other factors caused his failure to win that presidential ticket. Not being bitter and sad about his political misadventure, he worked assiduously and conscientiously for the progress and success of the PDP during the 1999 presidential election. That was a measure of his large-heartedness and desire for Nigeria’s progress and peaceful co-existence as one country. It is characteristic of the late Dr. Ekwueme to sacrifice his personal ambition , desires and interests at the altar of national good, a political trait that is not existing among today’s politicians.